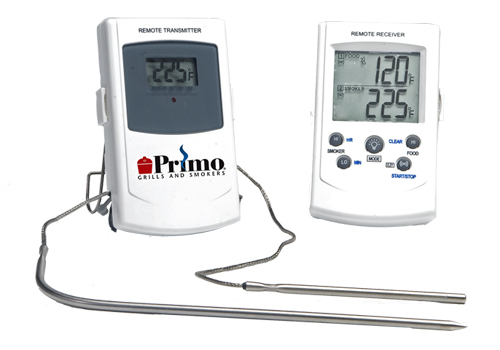 This Primo Digital Remote Thermometer for Primo Ceramic Barbecue Grills is one of the best tools you can use in conjunction with your Primo ceramic grill. You can use this heat-resistant thermometer to monitor the internal temperature of your food, or the heat of the air inside the smoking chamber. No more under- or over-done meats, no more guesswork on temperatures, and you can even set the thermometer to sound an alert when the desire temperature in food or in the chamber is reached. We're not even going to mention the belt clip, LCD back-lit screen for night use, or the stand that doubles as a hanger. If we had, though, you'd probably be wowed with all of the things the Primo Digital Remote Thermometer for Primo Ceramic Barbecue Grills can do for you and your outdoor cooking. WARNING: Burning charcoal in this product can expose you to checmicals including carbon monoxide which is know by the State of California to cause birth defects or reproductive harm. For more information go to www.P65Warnings.ca.gov. Can this be used on any grill or smoker? No, this product is only for use with Primo Ceramic BBQ Grills.